Tragic news is coming out of Egypt following today's match between Al-Masry and Al-Ahly in Port Said. After Al-Masry won the match, 3-1, its fans invaded the pitch, forcing Al-Ahly players to flee to the locker room, where they became trapped. Apparently, Al-Ahly Ultras took to the pitch too, and the long, violent history between the two clubs was extended as fans from the opposing clubs fought with each other, as well as with security forces. The violence was spurred by political conflict steaming from the events in Egypt last year. The most recent report from the BBC places the number of dead at 73. I'm sure that Al Jazeera will continue to update its stories as more information comes out. In the wake of the Arab Spring and the overthrow of Hosni Mubarak, professional football matches in Egypt have seen an uptick in violence as Ultras take advantage of the decreased amount of security in the stadiums. Meanwhile, in Cairo a match between Al-Ismailiya and Zamalek was called off, either to mourn those who were killed or to prevent the violence from spreading. The decision to call off the match was not well received by fans who managed to set sections of the stadium on fire. 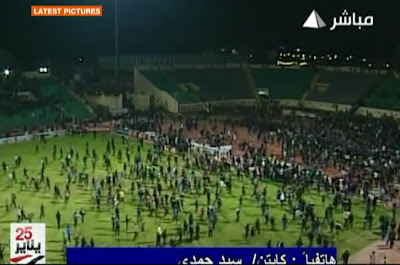 While today's events in Egypt are extreme, it does highlight the potential for danger whenever "fans" invade the pitch. While yesterday's pitch invasion at Goodison Park in Liverpool ended up proving harmless, the intent of the pitch invader was unknown when he exited the stands and the potential of a threat to players, coaches, officials, etc. existed. I'm not sure what more stadiums could do to increase the response time to pitch invaders, but now is a good time for the officials that run stadiums to take a hard look at the problem and see if they can come up with some new, reasonable solutions.